The Spa at Bedford Lodge Hotel in Newmarket has been designed with you in mind and boasts a wide selection of facilities to enhance your time with us. This includes 5 unique water experiences, with perfectly placed water jets to ease away aches and pains, sit back and relax and let the warm bubbles soothe your body. The perfect place to relax with a friend or partner where you can enjoy views of the famous racing paddocks. The rooftop terrace is especially beautiful on a sunny day when you can sit back, read a book and relax. A private steam room for two where you will be presented with an array of body muds to apply to yourselves to detoxify and cleanse the body. A relaxing and fun experience to share together. The perfect way to cool down after the heat experiences, with plenty of ice and ice cold water to rejuvenate your body. The ideal way to loosen muscular tensions before your treatments and allow the mind to relax. Sit or lay down in our thermal areas to fully enjoy the experience by laying on the hammam table. This area includes a luxury steam room & sauna. A beautiful calming space that you will can enjoy after your treatment to relax further. You will be greeted by soft lighting, music and an array of comfortable sofas to sink into and fall asleep under our soft blankets. Our treatment rooms have been thoughtfully designed to give a sense of space and comfort. The massage beds are wide and comfortable and heated from within, while the lighting and ambience will calm your senses you will also be greeted by the aromas of the ESPA aromatherapy products. The couples suite is ideal for those who would like some quality time together and to enjoy your treatments side by side. Our finishing touches room is a more sociable and fun environment to have your nail treatments done with a friend. We also serve drinks from our extensive menu here so you can always enjoy a glass of champagne while you relax. We have separate rooms available for visiting practioners and experts who visit The Spa at Bedford Lodge Hotel for monthly appointments, including our Botox and Dermal filler experts. The perfect place to relax in between spa treatments at our Suffolk Spa, the mezzanine has relaxing beds for you to read a book, a magazine, or just enjoy the tranquility of our luxury spa. 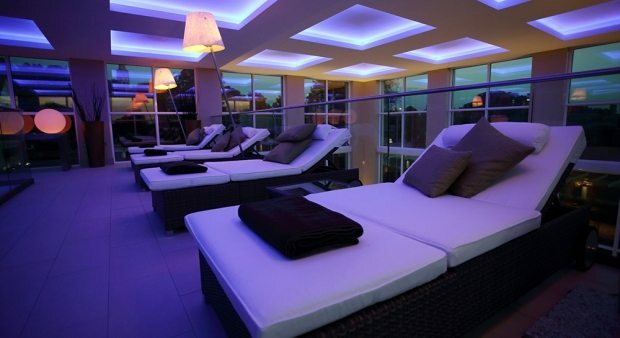 So for a fabulous spa treat in East Anglia, come to The Spa at Bedford Lodge Hotel in Newmarket.